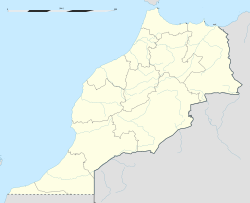 Agadir (Berber: Agadir, ⴰⴳⴰⴷⵉⵔ; Moroccan Arabic: اگادير‎) is a major ceety in soothwast Morocco, the caipital o Agadir-Ida Ou Tanane province (MA-AGD) an o the Souss-Massa-Drâa economic region some 508 km tae the sooth o Casablanca, 173 km frae Essaouira an 235 km tae the wast o Marrakech A majority o its indwallers speak Berber as thair mither tongue. The ceety is locatit on the shore o the Atlantic Ocean, near the fit o the Atlas Muntains, just north o the pynt whaur the Sous River flaes intae the ocean. This page wis last eeditit on 11 Mairch 2018, at 08:02.